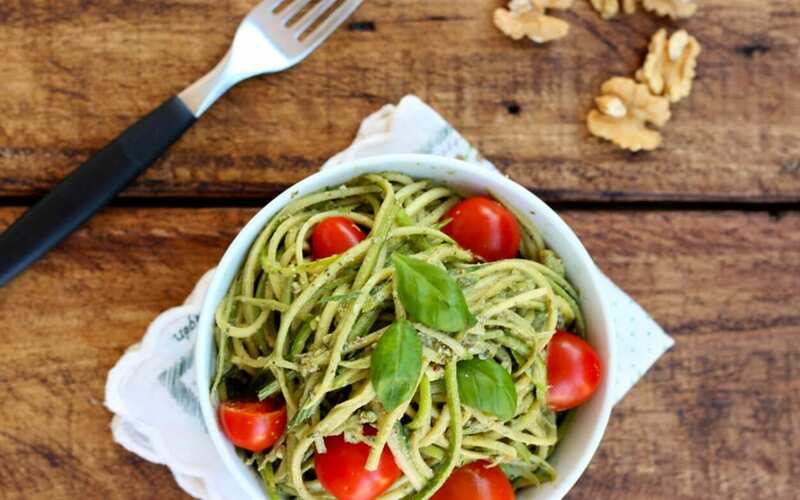 Get spiralizing with these sensational recipes! Here we present four sensational recipes to satisfy the latest veggie spiralizing craze. The fun thing about these recipes is that you can play around with them. They’re fairly straight forward, and almost all of the ingredients can be substituted to meet your preferences or suit your food tolerances. They’re also quick meals to whip up, with high nutritional content and low calorie content. The most demanding factor here is that you need certain kitchen equipment to make them properly. 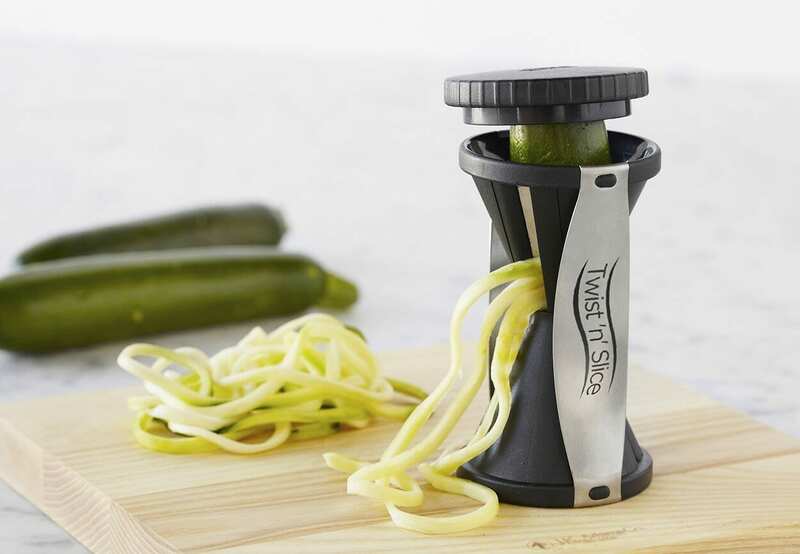 If you don’t yet have a spiral slicer (spiralizer), and are looking into getting one, check out some in-depth reviews on a few appliances right here. If you want to switch things around a bit – here is a list of vegetables that are ‘spiralizable’. Ali from Inspiralized (who gave up her job to write a blog on spiralizing) has an even longer list with instructions and recipes for each vegetable. You can find it here. Spiral the zucchini. Set aside in a colander to drain excess liquid. Drop cloves of garlic in, one at a time. Add avocado, olive oil, nutritional yeast, pine nuts and lemon juice. Pulse until blended. Notes: My version uses avocados and kale! I can never get enough kale and why not incorporate it into an avocado pesto? This raw recipe is simple to throw together. 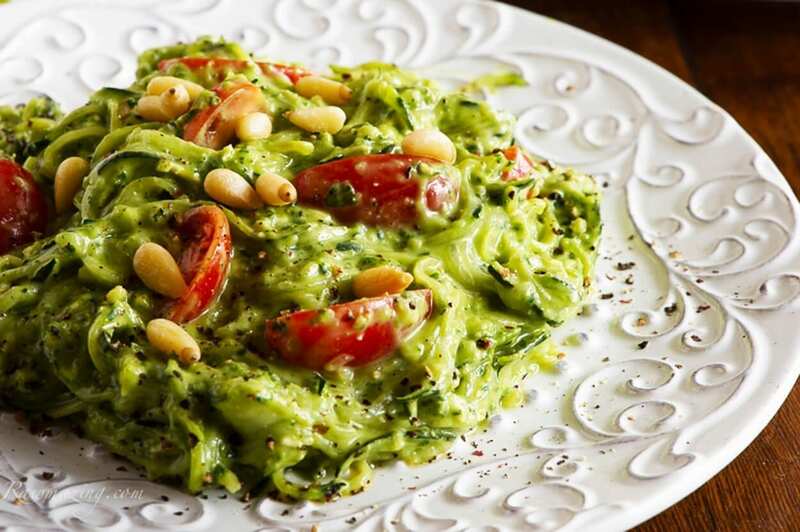 Toss the pesto with some zucchini noodles and tomatoes and you have a very satisfying meal. Avocados contain an amazing array of carotenoids. They are also anti-inflammatory. They help digestion, are high in vitamin K, fibre, folate and vitamin C. Avocados are also high in fat but it is considered to be the good fat that helps you absorb nutrients, protects you from inflammation, and helps lower your risk of heart disease. Did you know that pine nuts are high in iron and magnesium? And kale, well, we all know what a nutritional powerhouse kale is. At only 36 calories a cup, the kale in this recipe helps lighten it up while providing you with fibre, vitamin K, vitamin C, vitamin A, calcium, iron and more. You can use kelp noodles, but I love this mixed with spiralled zucchini pasta. I use this spiralizer. Toss zucchini, cheddar, quinoa, oil and salt together in a bowl then spread into a baking dish. Notes: I can’t guarantee your family will eat zucchini or quinoa on it’s own served plainly at dinner, but combining them into this masterpiece will surely win them over. If not, you can enjoy it all to yourself for a few days worth! Place a large skillet over medium heat and coat with cooking spray. Add the sweet potato noodles to the skillet and cook, turning frequently, for about 10 minutes or until noodles have completely softened. Add the noodles into a bowl and add in the pumpkin spice. Mix to combine thoroughly. Add in the full egg and toss to combine. Spray the waffle iron with cooking spray and pack in the noodles. You may have to play around with the noodles to get them to fit in all of the grooves. Cook the waffle according to the iron’s settings. Notes: These waffles really hit the spot. There’s quite a synergy between the pumpkin spice and the sweet potatoes… it actually reminds me of Thanksgiving. 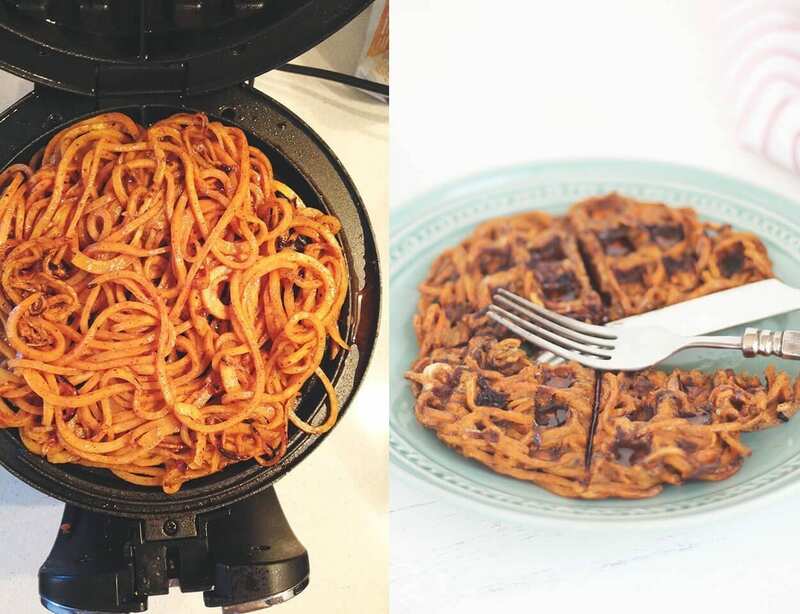 They are simple to make – just cook the noodles, season with pumpkin spice, mix in an egg, pack into a waffle iron and voila: 3 ingredient waffles that won’t bloat you but sure look and taste like they will. Place a large skillet over medium heat. Coat with cooking spray and add in your chicken. Season with salt and pepper and let cook for about 3 minutes and then flip over, cooking another 3-5 minutes or until the chicken is cooked through. Then, add in the lemon juice, spinach, zucchini and garlic powder. Let cook, tossing frequently, until spinach is wilted and zucchini noodles soften, about 3 minutes. When done, use pasta tongs to transfer to a bowl. Season with pepper, top with feta and enjoy! Notes: This lunch is one of my favourites – the feta is a naturally low-fat cheese that offers a huge salty flavour. 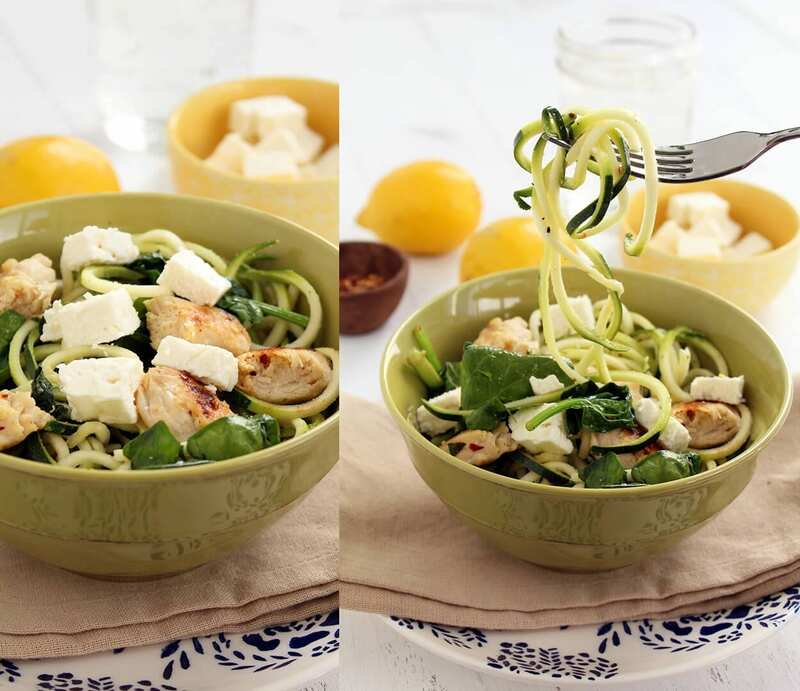 The chicken is a lean protein that keeps you satisfied and fuelled, while the spinach and zucchini noodles give you that fibrous vegetable boost. It’s a perfect light lunch, suitable for someone trying to maintain their weight. Plus, there’s no olive oil here, so the calories are low and the added red pepper flakes give it a spicy kick. The lemon juice aids with digestion and keeps this pasta dish refreshing and tasty.